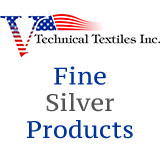 Conductive Spun Yarn - 5% Silver Plated Nylon and 95% Cotton Ne 30/1 or Nm 50/1. Purpose: Anti-microbial applications for knitting or weaving. Approx. Four pound cone.